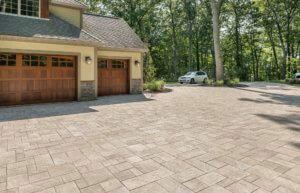 Are you looking for interlock pavers for your home? Choosing the right interlock pavers is not always easy! There are a variety of colors, textures, and sizes available. One thing is for sure, interlock pavers are durable and create a beautiful finished project. People are often confused between the difference in concrete pavers and slabs. We’re about to clear up the confusion! Concrete pavers are usually 70-90mm (2 3/4″ – 3 9/16″) thick. Their thickness, in turn, means heavy objects, such as cars, can drive and park directly on them. In contrast, concrete slabs are usually 60mm (2 3/8″) or less. These products are not to be used for an interlock paver driveway as they are too thin and cannot withstand heavy weights. 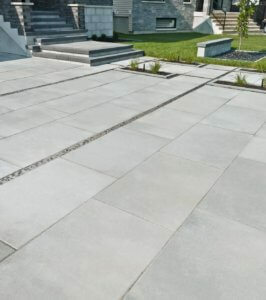 Therefore, 60mm or less slabs are perfect for backyards or pathways. Also note, since slabs are less thick, they come at a lesser cost per square foot than pavers. *Industry tip: the best thing to do is to use 70mm or more pavers on your driveway, and the matching 60mm or less slab for your backyard. 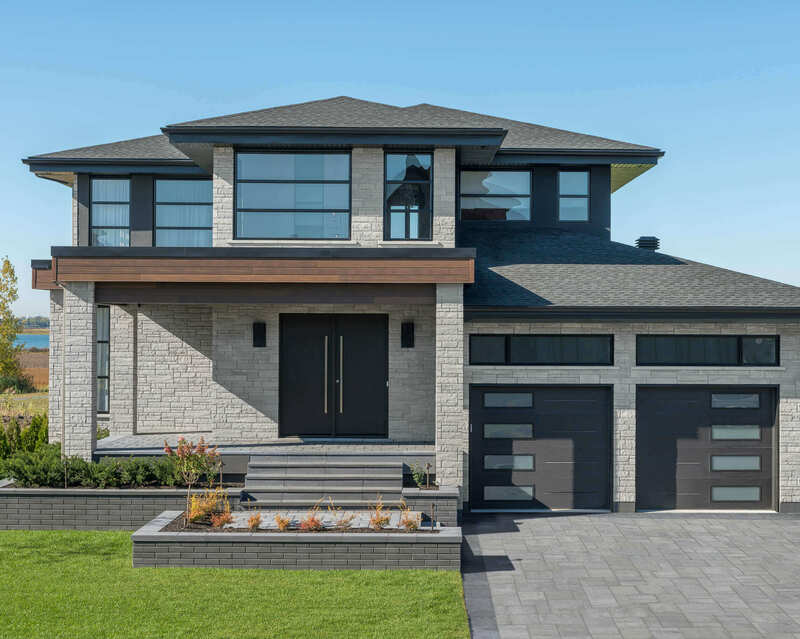 Rinox offers a variety of matching paver and slab products, so you can harmonize the front of your home with your backyard. Now that you have a better understanding of the paver versus slab difference, you can start your research. 1. Is it for a backyard project, driveway, or both? Know this, in order to be sure you are looking for the correct products (see pavers versus slab breakdown above). Aren’t convinced interlock pavers are the best choice for your project? Check out this post “Increase the value of your property thanks to your landscaping” or this one, by Carson Arthur “Deck vs Patio what is best for you?“. 2. 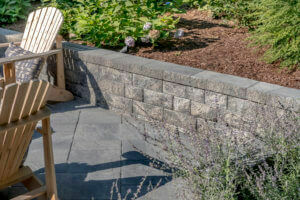 Do you need a retaining wall to use as a flower bed, bench or outdoor kitchen area? If so, be sure to check out our collection of retaining walls to match the interlock pavers or slabs you choose. 3. Do you prefer grey tones or lighter beiges and whites? 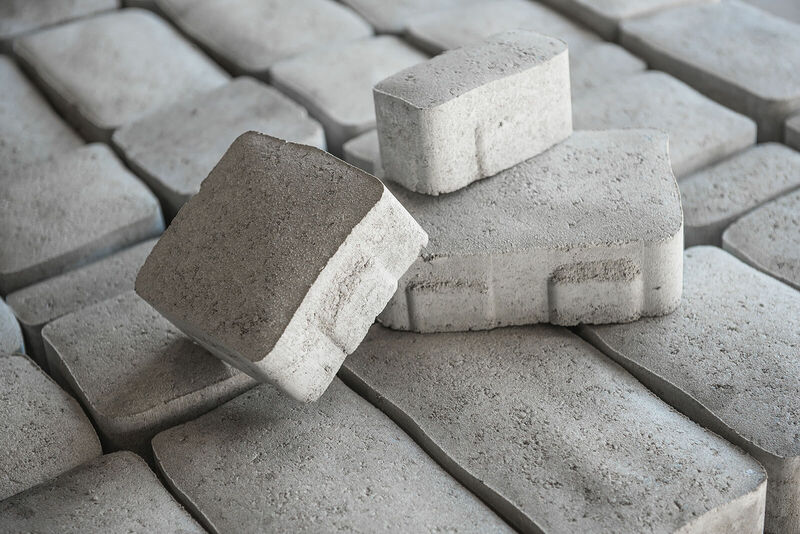 A new trend this year is interlock pavers in the color silver white. Although a beautiful color, it cannot be used as a driveway paver since tire tracks leave noticeable marks on white pavers. Therefore, the silver white color is only available in our collection of 60mm or less slabs. For other trends check out our blog post on our 3 favorite trends of the season. NOW THAT YOU KNOW WHAT TO KEEP IN MIND, YOU CAN START YOUR RESEARCH! 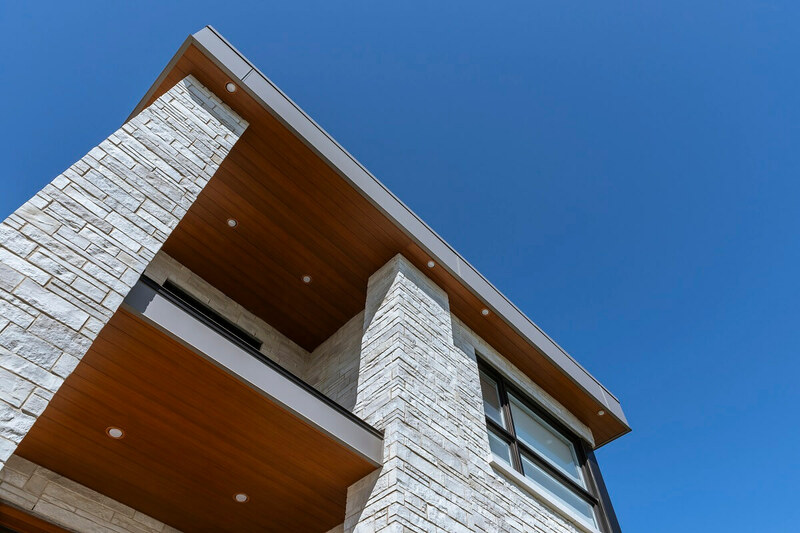 The modern style for concrete products is characterized by smooth textures, large sizes, and straight lines. Our Proma paver and slab collection includes those colossal sizes. The newest and most popular products include the Proma 3xl, Proma Quadra, and Proma XL. All these products are available as a paver and a slab, so your entire project can match! An example of the Proma 3XL paver in ash charcoal installed in a driveway. 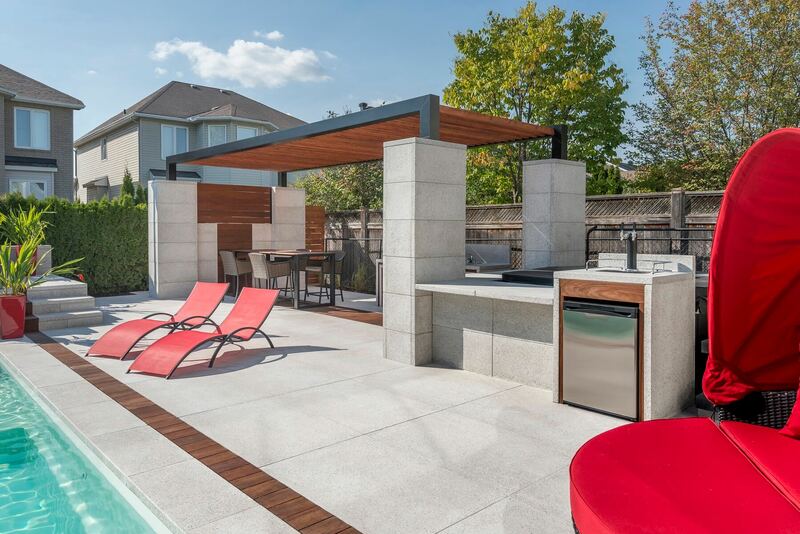 An example of the Proma Quadra slab in ash charcoal installed in an ultra-modern backyard project. 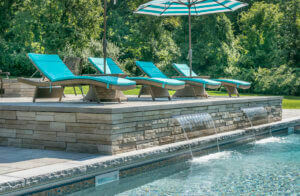 The most modern retaining wall in our landscape collection is the Solino wall. It is often installed alongside our Proma collection as they are offered in many of the same colors. The versatile Solino wall is a reversible product with two faces: smooth face or multi-dimensional face. The multi-dimensional wall is sure to make a statement in your yard. 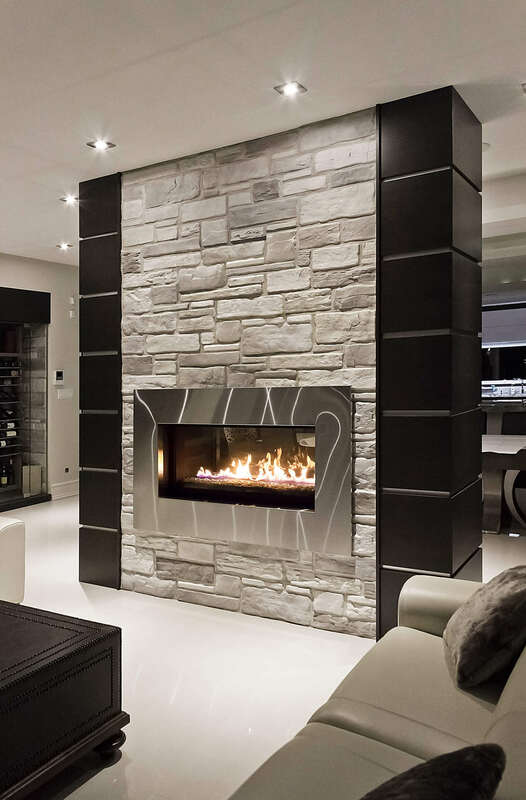 For more ideas on how to use our modern and versatile Solino wall check out our post. 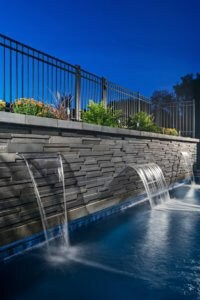 Another modern retaining wall is the Ora wall. It is a large size and has a smooth face. The perfect product if you are looking for something to blend in with the modern look. An example of the modern Ora wall in ash charcoal used as a privacy fence. 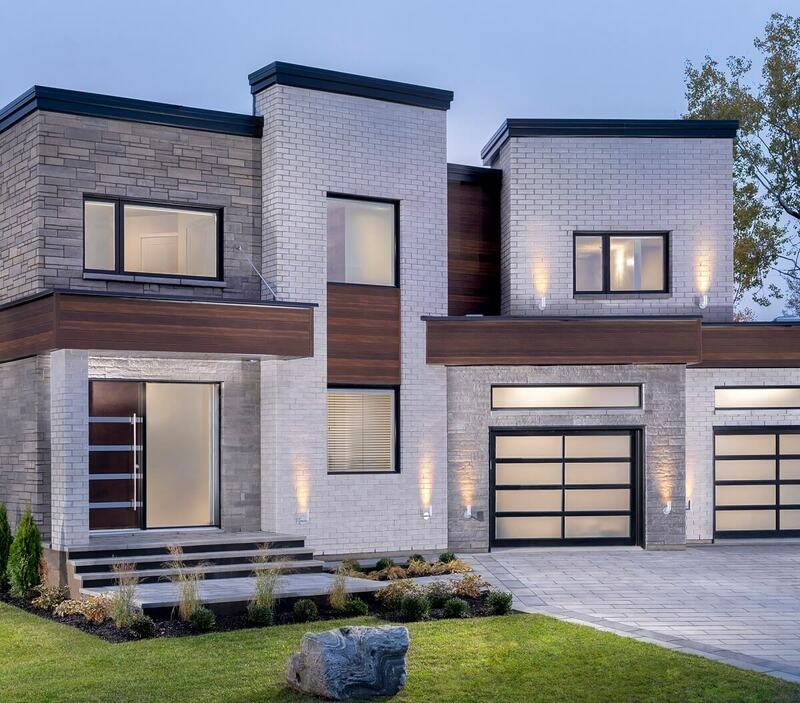 However, the ultra-modern look may not be for everyone. Don’t worry, if you prefer a mix of traditional and modern, we have some inspiration for the contemporary style too! The contemporary style in concrete products means a mix of both smooth and textured products together in one project. This style often has modular lines, which means the interlock pavers are installed in a puzzle-like pattern. There are many ways to achieve this look! 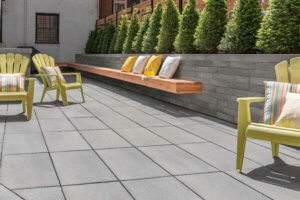 Another way to get the contemporary look is to match our Monti wall with medium-sized interlock pavers or slabs. The monti wall has a textured surface and a large size. Perfect for a contemporary project. Lastly, if you are still not seeing something you love, maybe you’re looking for something more traditional. 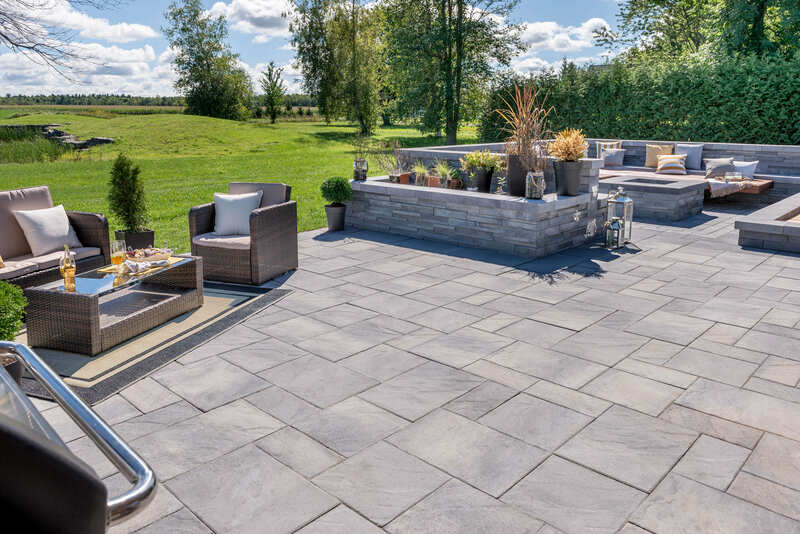 Traditionally, interlock pavers are small sized with a textured or rounded surface.For example, our Dakota paver has a modular pattern (puzzle-like) and a textured surface. Our Rio retaining wall is the perfect match to the traditional style. A classic in our Landscaping collection, the Rio wall goes beautifully with our small sized pavers including the Dakota paver, the Zuko paver, the Mega Phenix paver and many more. As you can see, Rinox has a product for every style. Hopefully, you have narrowed down your favorites to be able to choose the right interlocking pavers for your project! It’s now time to schedule a meeting with your landscape contractor. Check out this post to help you prepare for your meeting with your landscaper.